HIPAVE (Heavy Industrial PAVEment design) is software for design of flexible pavements in facilities such as intermodal container terminals and yards. HIPAVE models the extremely heavy loads from vehicles such as mast lifts, reachstackers, straddle carriers etc. HIPAVE is an outgrowth of CIRCLY and APSDS (Airport Pavement Structural Design System). CIRCLY was first released in 1977 and APSDS in 1995.
automatic calculation of axle loads from vehicle geometry and container weight. HIPAVE handles the variety of mobile equipment used in container facilities, such as forklifts, mast lifts, reachstackers, straddle carriers, gantry cranes and side loaders. HIPAVE takes account of vehicle wander at a more fundamental level than earlier methods. Wander is the measure of how successive vehicle movements deviate from lane centre lines. Increased wander reduces pavement damage by different amounts that depend on pavement thickness. Incorporating wander can lead to significant savings in construction costs. automatic sub-layering of unbound granular materials. Click here to view two conference papers on HIPAVE – how it works and two Case Studies. Click here for more details on HIPAVE. 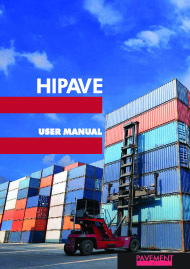 We developed the Heavy Duty Industrial Pavement Design Guide to help users of the HIPAVE software. The Guide is a collaborative effort currently involving Leigh Wardle of Mincad Systems, Ian Rickards (Pioneer Road Services Pty Ltd, Melbourne, Australia), John Lancaster (VicRoads, Australia) and Dr. Susan Tighe (Dept. Civil Engineering, University of Waterloo, Canada). Download the Guide: Heavy Duty Industrial Pavement Design Guide. Here is an article that explains why road design methods are not appropriate for the heavy loadings encountered at airports and container terminals. Road design methods can give grossly under-designed pavements. For further details see Layered Elastic Design Of Heavy Duty And Industrial Pavements – Rodway, B. and Wardle, L.J. (1998).